Programmable logic has been around for well over two decades. Today, due to larger and cheaper devices on the market, FPGAs and CPLDs are finding their way into a wide array of projects, and there is a plethora of languages to choose from. VHDL is the popular choice outside of the U.S. It is preferred if you need a strong typed language. However, the focus of this article will be on another popular language called Verilog, which is a hardware description language that is similar to the C language. Typically, Verilog is used in the ASIC design industry. Companies such as Sun Microsystems, Advanced Micro Devices, and NVIDIA use Verilog to verify and test new processor architectures before committing to physical silicon and post-fab verification. However, Verilog can be used in other ways, including implementing complex designs such as a VGA interface. Another complex design such as an Ethernet controller can also be written in Verilog and implemented in a programmable device. This article is mostly tailored to engineers who need to learn Verilog and do not know or know little about the language. Those who know VHDL will benefit from reading this article as well and should be able to pick up Verilog fairly quickly after reviewing the example listings and referring to the Resources at the end of the article. This article does not go over hardware, but I have included some links that will help you learn more about how the hardware interacts with this language at the end. First, it is best to know what variable types are available in Verilog. The basic types available are: binary, integer, and real. Other types are available but they are not used as often as these three. Keep everything in the binary number system as much as possible because type casting can cause post-implementation issues, but not all writers are the same. Binary and integer types have the ability to use other values such as “z” (high impedance) and “x” (don’t care). Both are nice to have around when you want a shared bus between designs or a bus to the outside world. Binary types can be assigned by giving an integer value. However, there are times when you want to assign or look at a specific bit. Some of the listings use this notation. In case you are curious, it looks like this: X’wY, where X is the word size, w is the number base—b for binary, h for hex—and Y is the value. Any value without this is considered an integer by default. Keeping everything in binary, however, can become a pain in the neck especially when dealing with numbers larger than 8 bits. 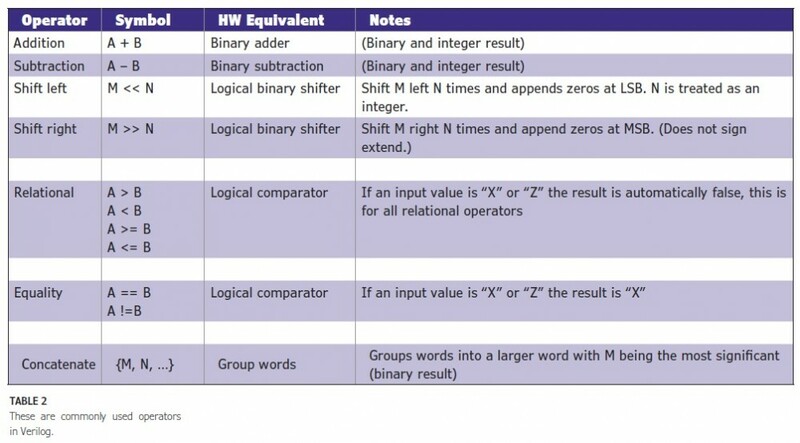 Table 1 shows some of the variable types that are available in Verilog. Integer is probably the most useful one to have around because it’s 32 bits long and helps you keep track of numbers easily. Note that integer is a signed type but can also be set with all “z” or “x.” Real is not used that much, when it is used the number is truncated to an integer. It is best to keep this in mind when using the real type, granted it is the least popular compared to binary and integer. When any design is initialized in a simulator, the initial values of a binary and integer are all “x.” Real, on the other hand, is 0.0 because it cannot use “x.” There are other types that are used when interconnecting within and outside of a design. They are included in the table, but won’t be introduced until later. Some, but not all, operators from C are in Verilog. Some of the operators available in Verilog are in Table 2. It isn’t a complete list, but it contains most of the more commonly used operators. Like C, Verilog can understand operations and perform implicit casting (i.e., adding an integer with a 4-bit word and storing it into a binary register or even a real); typically this is frowned on mostly due to the fact that implicit casting in Verilog can open a new can of worms and cause issues when running the code in hardware. As long as casting does not give any erroneous results during an operation, there should be no show-stoppers in a design. Signed operation happens only if integers and real types are used in arithmetic (add, subtract, multiply) operations. In Verilog, designs are called modules. A module defines its ports and contains the implementation code. 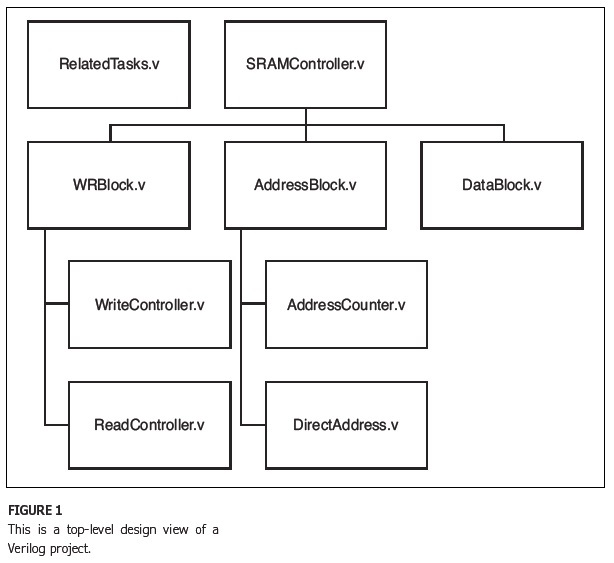 If you think of the design as a black box, Verilog code typically looks like a black box with the top missing. Languages like Verilog and VHDL encourage black box usage because it can make code more readable, make debugging easier, and encourage code reuse. In Verilog, multiple code implementations cannot have the same module name. 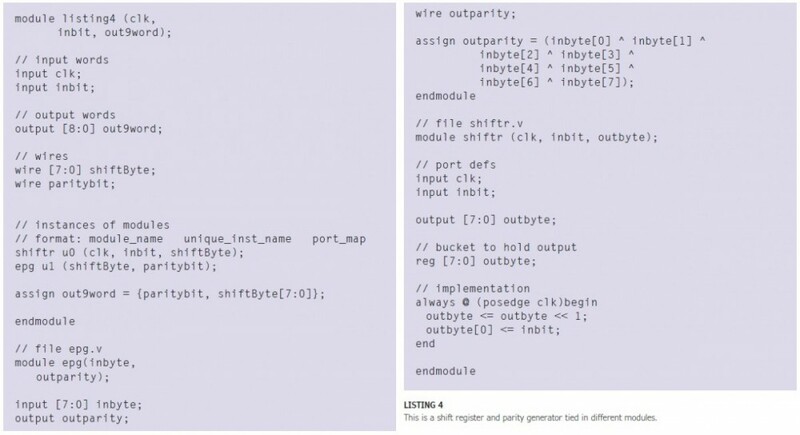 This is in stark contrast to VHDL, where architectures can share the same entity name. The only way to get around this in Verilog is to copy a module and rename it. In Listing 1, a fairly standard shift register inserts a binary value at the end of a byte every clock cycle. If you’re experienced with VHDL, you can see that there aren’t any library declarations. This is mainly due to the fact that Verilog originated from an interpretive foundation. However, there are include directives that can be used to add external modules and features. Obviously, the first lines after the module statement are defining the modules’ port directions and type with the reserved words input and output. There is another declaration called inout, which is bidirectional but not in the listing. 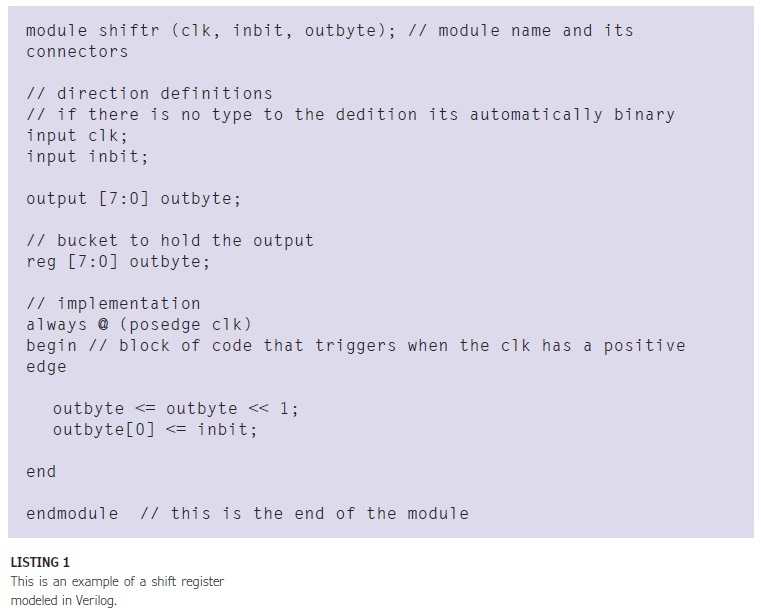 A module’s input and output ports can use integer and real, but binary is recommended if it is a top-level module. The reg statement essentially acts like a storage unit. Because it has the same name as the output port it acts like one item. Using reg this way is helpful because its storage ability allows the output to remain constant while system inputs change between clock cycles. There is another kind of statement called wire. It is used to tie more than one module together or drive combinational designs. It will appear in later listings. The next line of code is the always statement or block. You want to have a begin and end statement for it. 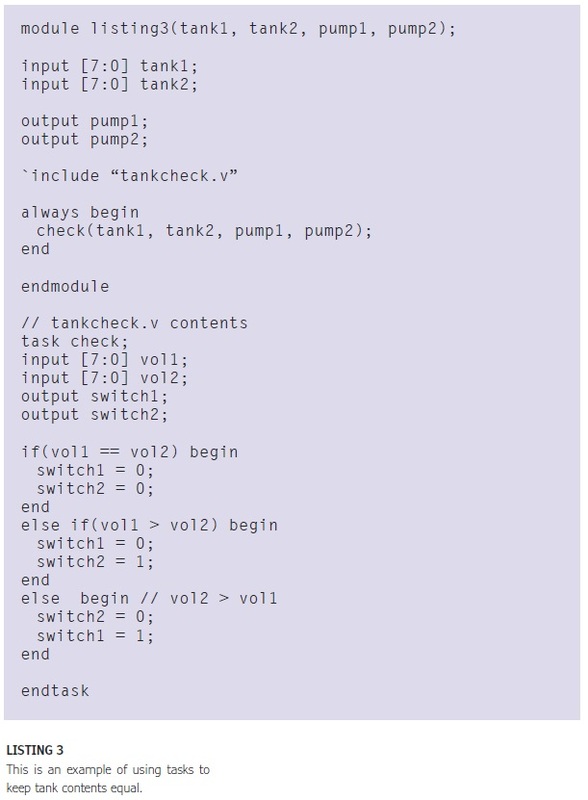 If you know VHDL, this is the same as the process statement and works in the same fashion. 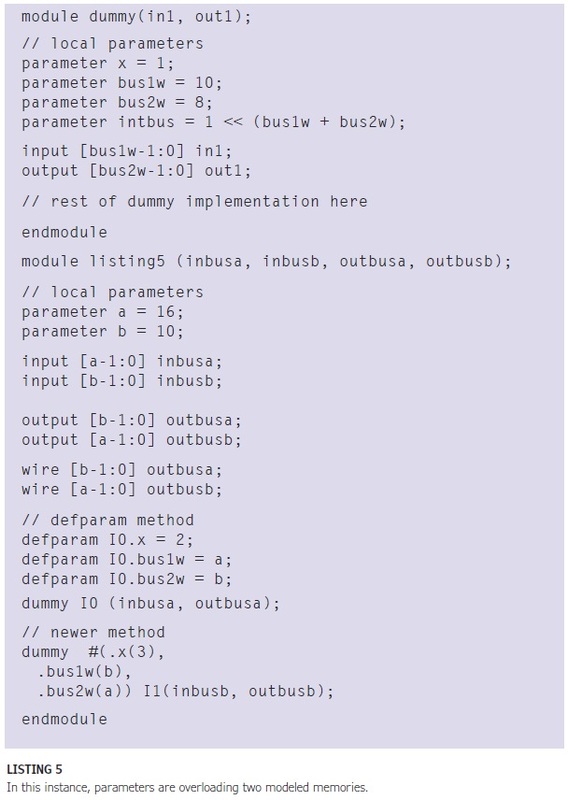 If you are completely new to programmable logic in general, it works like this: “For every action X that happens on signals indicated in the sensitivity list, follow these instructions.” In some modules, there is usually a begin and an end statement. This is the equivalent of curly braces seen in C/C++. It’s best to use these with decision structures (i.e., always, if, and case) as much as possible. Finally, the last statement is a logical left shift operation. Verilog bitwise operators in some instances need the keyword assign for the operation to happen. The compiler will tell you if an assign statement is missing. From there, the code does its insertion operation and then waits for the next positive edge of the clock. This was a pretty straightforward example; unfortunately, it doesn’t do much. The best way to get around that is to add more features using functions, tying-in more modules, or using parameters to increase flexibility. Tasks and functions make module implementation clearer. Both are best used when redundant code or complex actions need to be split up from the main source. There are some differences between tasks and functions. A task can call other tasks and functions, while a function can call only other functions. A task does not return a value; it modifies a variable that is passed to it as an output. Passing items to a task is also optional. Functions, on the other hand, must return one and only one value and must have at least one value passed to them to be valid. Tasks are well-suited for test benches because they can hold delay and control statements. 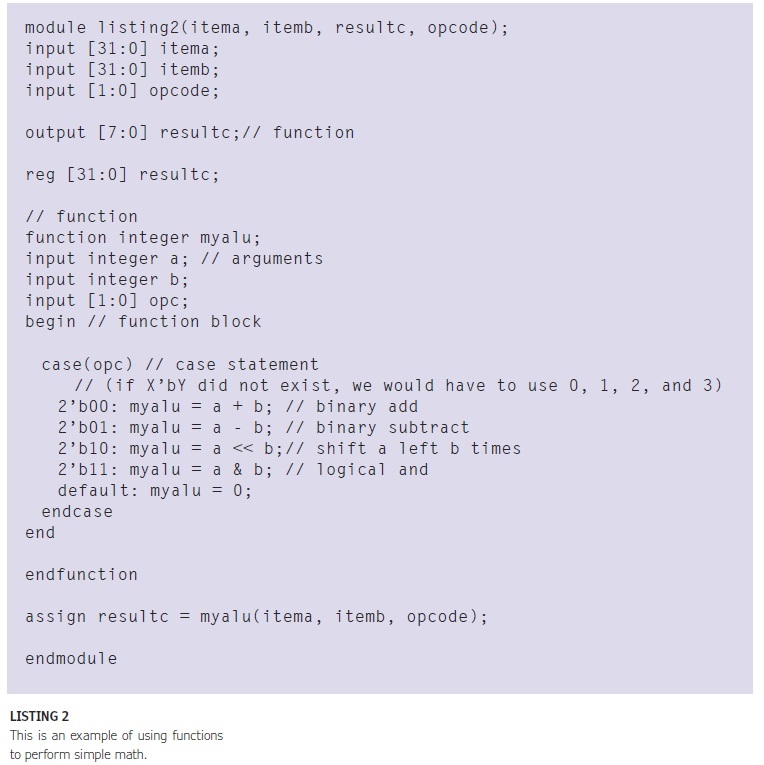 Functions, however, have to be able to run within one time unit to work. This means functions should not be used for test benches or simulations that require delays or use sequential designs. Experimenting is a good thing because these constructs are helpful. There is one cardinal rule to follow when using a function or task. They have to be defined within the module, unlike VHDL where functions are defined in a package to get maximum flexibility. Tasks and functions can be defined in a separate file and then attached to a module with an include statement. This enables you to reuse code in a project or across multiple projects. Both tasks and functions can use types other than binary for their input and output ports, giving you even more flexibility. Listing 2 contains a function that essentially acts like a basic ALU. Depending on what is passed to the function, the function will process the information and return the calculated integer value. Tasks work in the same way, but the structure is a little different when dealing with inputs and outputs. As I said before, one of the major differences between a task and a function is that the former can have multiple outputs, rather than just one. This gives you the ability to make a task more complicated internally, if need be. Listing 3 is an example of a task in action with more than one output. Note how it is implemented the same way as a function. It has to be defined and called within the module in order to work. But rather than define the task explicitly within the module, the task is defined in a separate file and an include directive is added in the module code just to show how functions and tasks can be defined outside of a module and available for other modules to use. If too much is added to a module, it can become so large that debugging and editing become a chore. Doing this also minimizes code reuse to the point where new counters and state machines are being recreated when just using small modules/functions from a previous project is more than adequate. A good way to get around these issues is by making multiple modules in the same file or across multiple files and creating an instantiation of that module within an upper-level module to use its abilities. Multiple modules are good to have for a pipelined system. This enables you to use the same kind of module over multiple areas of a system. Older modules can also be used this way so less time is used on constant recreation. That is the idea of code reuse in a nutshell. Now I will discuss an example of code reuse and multiple modules. The shift register from Listing 1 is having its data go into an even parity generator and the result from both modules is output through the top-level module in Listing 4. All of this is done across multiple files in one listing for easier reading. In all modular designs, there is always a module called a top-level entity, where all of the inputs and outputs of a system connect to the physical world. It is also where lower-level entities are spawned. Subordinates can spawn entities below themselves as well (see Figure 1). Think of it as a large black box with smaller black boxes connected with wires and those small black boxes have either stuff or even smaller black boxes. Pretty neat, but it can get annoying. Imagine a situation where a memory controller for 10-bit addressing is created and then the address length needs to be extended to 16 bits. That can be a lot of files to go through to change 10 to 16. However, with parameters all that needs to be changed is one value in one file and it’s all done. Parameters are great to have around in Verilog and can make code reuse even more attractive. Parameters allow words to take the place of a numerical value like #define in C, but with some extra features such as overriding. Parameters can be put in length descriptors, making it easy to change the size of an output, input, or variable. For example, if a VGA generator had a color depth of 8 bits but needed to be changed to 32-bit color depth, then instead of changing the locations where the value occurs, only the value of the parameter would be changed and when the module was recompiled it would be able to display 32-bit color. The same can be done for memory controllers and other modules that have ports, wires, or registers with 1 bit or more in size. Parameters can also be overridden. This is performed just before or when a module is instantiated. This is helpful if the module needs to be the same all the time across separate projects that are using the same source, but needs to be a little different for another project. Parameters can also be used in functions and tasks as long as the parameter is in the same file the implementation code is in. Parameters with functions and tasks give Verilog the flexibility of a VHDL package, granted it really isn’t a package, because the implementation is located in a module and not in a separate construct. There are many ways to override parameters. One way is by using the defparam keyword, which explicitly changes the value of the parameter in the instantiated module before it is invoked. Another way is by overriding the parameter when the module is being invoked. Listing 5 shows how both are done with dummy modules that already have defined parameters. The defparam method is from an older version of the language, so depending on the version of Verilog being used, make sure to pick the right method. We’d like to introduce you to Colin O’Flynn, who will begin writing a bimonthly column titled “Programmable Logic In Practice” for Circuit Cellar beginning with our October issue. You may have already “met.” Since 2002, Circuit Cellar has published five articles from this Canadian electrical engineer, who is also a lecturer at Dalhousie University in Halifax, Nova Scotia, and a product developer. Colin has been fascinated with embedded electronics since he was a child and his father gave him a few small “learn to solder” kits. Since then, he has constructed many projects, earned his master’s in applied science from Dalhousie, pursued graduate studies in cryptographic systems, and become an engineering consultant. Over the years, he has developed broad skills ranging from electronic assembly (including SMDs), to FPGA design in Verilog and VHDL, to high-speed PCB design. And he likes to share what he knows, which makes him a good choice for Circuit Cellar. One of his most recent projects was a Binary Explorer Board, which he developed for use in teaching a digital logic course at Dalhousie. It fulfilled his (and his students’) need for a simple programmable logic board with an integrated programmer, several switches and LEDs, and an integrated breadboard. He is working to develop the effective and affordable board into a product. In the meantime, he is also planning some interesting column topics for Circuit Cellar. use of tools such as Altera’s OpenCV libraries to design programmable logic using C code; use of vendor-provided and open-source soft-core microcontrollers; design of a PCI-Express interface for your FPGA; and addition of a USB 3.0 interface to your FPGA. That’s just a short list reflecting his interest in programmable logic technologies, which have become increasingly popular with engineers and designers. To learn more about Colin’s interests, check out our February interview with him, his YouTube channel of technical videos, and, of course, his upcoming columns in Circuit Cellar. Field-programmable gate arrays (FPGAs) have been around for more than two decades. What does the future hold for this technology? According to Halifax, Canada-based electrical engineering consultant Colin O’Flynn, current FPGA-related research and recent innovations seem to presage a coming revolution in digital system design, and this could lead to striking fast advances in several fields of engineering. Microcontrollers have long played the peripheral game: the integration of easy-to-use dedicated peripherals onto the same physical chip as your digital core. FPGAs, it would seem, have no use for dedicated logic, since you can just design everything exactly as you desire. But dedicated logic has its advantages. Beyond technical advantages, such as lower power consumption or smaller area with dedicated cores compared to programmable cores, dedicated cores can also reduce development effort. For example, current technology sees FPGAs with integrated high-end ARM cores, capable of running Linux on the integrated hard-core. Anyone familiar with setting up Linux on an ARM-based microprocessor can use this, without needing to learn about how one develops cores and peripherals on the FPGA itself. Beyond integrating digital cores to simplify development, you can expect to see the integration of analog peripherals. Looking at the microcontroller market, you can find a variety of tightly integrated SoC devices with analog and digital on a single device. For instance, a variety of radio devices contain a complete RF front-end combined with a digital microcontroller. While current FPGA devices offer very limited analog peripherals (most have none), having a FPGA with an integrated high-speed ADC or DAC would be the making of a highly flexible radio-on-a-chip platform. The high development cost and lack of a current market has meant this remains only an interesting idea. To see where this market comes from, let’s look at some applications for such an FPGA. The VisualSonic Studio project on display at Design West last week was as innovative as it was fun to watch in operation. The design—which included an Altera DE2-115 FPGA development kit and a Terasic 5-megapixel CMOS Sensor (D5M)—used interactive tokens to control computer-generated music. I spoke with Allen Houng, Strategic Marketing Manager for Terasic, about the project developed by students from National Taiwan University. He described the overall design, and let me see the Altera kit and Terasic sensor installation. Houng also he also showed me the design in action. To operate the sound system, you simply move the tokens to create the sound effects of your choosing. Below is a video of the project in operation (Source: Terasic’s YouTube channel).